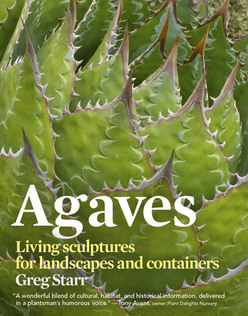 Greg Starr is widely acknowledged as an expert on agaves. An astute observer of agaves in the wild, he also has broad experience with their performance in cultivation. In vivid detail he profiles 75 species, cultivars, and hybrids best suited to gardens and landscapes. Each entry includes field notes as well as a detailed description of the plant, along with its cultural requirements, including hardiness, sun exposure, water needs, soil requirements and methods of propagation. Because agaves can change dramatically as they age, photos show species from youth to maturity, a unique feature of this book. Distribution, taxonomy, horticultural history and essentials of cultivation complete the in-depth treatment. Agaves are easy to love—they’re low-maintenance, drought-tolerant and strikingly sculptural, with an astounding range of forms and colours. Equally suited to container-growing and in-ground culture, they combine versatility with growability, and while many species originate in desert and near-desert areas, they are easily cultivated in garden settings. What’s more, they’re much hardier than previously thought: given good drainage, many varieties are hardy to zone 6, or even zone 5. Greg Starr is the owner of Starr Nursery, that specializes in agaves, cacti and drought-tolerant shrubs. As useful to specialists as to enthusiasts who are just beginning to explore the dazzlingly diverse world of agaves, this authoritative guide is sure to spur the growing popularity of these amazing plants.